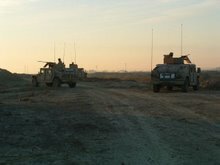 WASHINGTON - Like many Soldiers deployed to Iraq or Afghanistan, Soldiers from the Oregon National Guard's 2nd Battalion, 162nd Infantry brought their personal cameras to Iraq during their deployment in 2004. They snapped photos of each other firing weapons, shot video of explosives they detonated and logged plenty of footage of their own commentaries intermixed with Soldier humor. 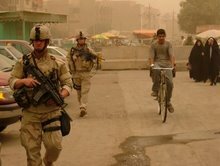 But they never expected that their day-to-day antics would one day represent deployed National Guard Soldiers everywhere, preserved in a feature-length documentary film called "This is War: Memories of Iraq." 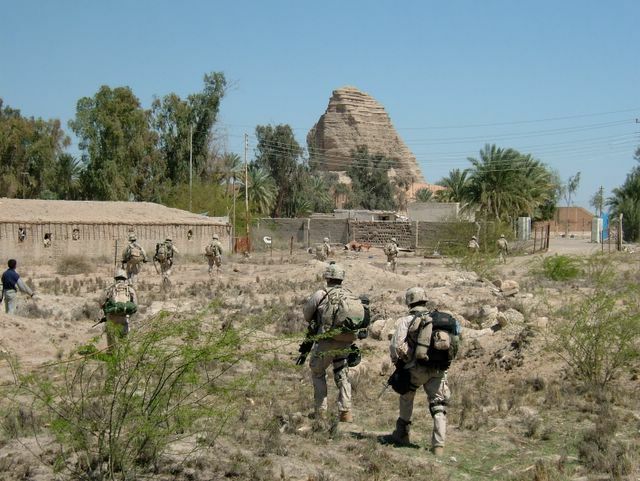 The National Combat History Archive and Lucky Forward Films used the unscripted testimonies of nine Soldiers of varying ranks and experiences to narrate the events. Photos and video they shot with their own personal cameras illustrate their experiences. 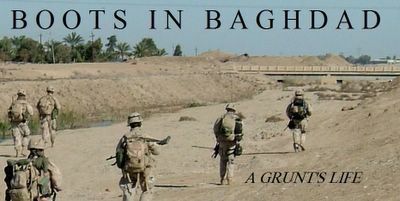 "We wanted to make a very non-political film that took someone who's never been to Iraq ... to show what it means to go into combat," said the film's director, Gary Mortensen. "We told it in a non-specific way so that it could represent Soldiers everywhere - we wanted to tell a tale that anyone who has been over there can identify with." 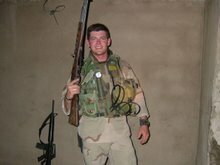 Mr. Mortensen added that the unique thing about the film is that these Soldiers had their own personal recording devices on hand, giving an intimate view of what they saw on a daily basis. The Soldiers had no idea any of it would be turned into a film, so the result is a very honest and raw portrait of their experiences. "It's very powerful," said Sgt. 1st Class Phillip "Vince" Jacques, one of the Soldiers featured in the film. 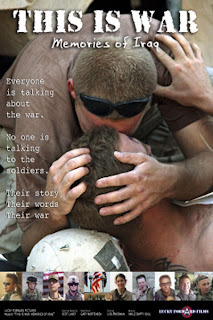 "It really represents the professionalism of these guys and shows exactly what troops are going through over there. They're the ones fighting the war. You might as well hear their story." Present at various screenings of the film, Sgt. 1st Class Jacques noticed that the audience's reaction was often one of awe. "Whether they support the war or not, they come away with a whole different view of what Soldiers are doing over there," he said. National audiences are also beginning to take notice. "This is War" won the Audience Choice Award and Best Documentary at the Idaho International Film Festival, and received the Jury Award: Best Documentary at the Florida International Media Market. It also took home awards for best documentary and best director at the Sweet Onion Film Festival in Walla Walla, Wash. Unfortunately, the film isn't available in local video stores yet; Mr. Mortensen explained that they are working on the film's distribution and broadcast rights. It can be purchased by calling (503) 597-7030 or by checking out the Web site at www.luckyforwardfilms.com. According to the site, all sales of the film help support the Fallen Soldiers Relief Fund, the National Combat History Archive, the Iraq/Afghanistan Oregon Memorial Fund and the Wounded Warriors Project, a non-profit organization that helps injured servicemembers by providing programs and services to meet their unique needs. 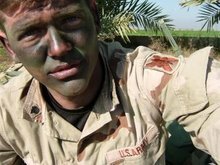 Photo - The National Combat History Archive and Lucky Forward Films used the unscripted testimonies of nine Oregon National Guard Soldiers of varying ranks and experiences to narrate the events of the film "This is War: Memories of Iraq." 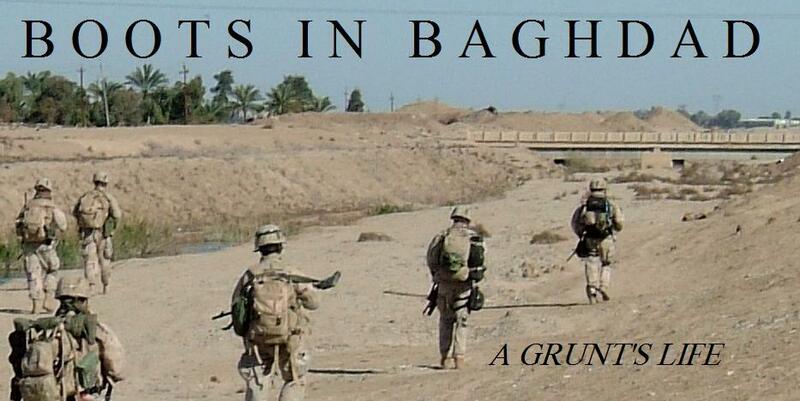 Photos and video the Soldiers shot with their own personal cameras illustrate their experiences. (Contributed Photo). FORWARD OPERATING BASE HERO, Afghanistan – Airmen in a medical mentoring team here have been working hard to ensure the successful opening of an Afghan National Army hospital for the past several months. The team’s original mission was to mentor their Afghan counterparts and teach them medical skills to treat Afghan military and police members, said Air Force Col. Mike Skidmore, the team’s senior mentor officer and administrator. All that changed when the team arrived several months ago, he said. The hospital was 500 days behind schedule, and instead of finding equipment and eager ANA medical personnel, the team found an empty, incomplete facility. “We had to move from a mentoring mission to a new mindset of equipping the hospital, opening it and then mentoring,” said Air Force Col. (Dr.) Thomas Seay, the senior medical mentor and chief radiologist. Most of the state-of-the-art equipment, to include a digital X-ray and digital ultrasound machines, were purchased by the United States, with some items – such as wheelchairs -- donated by a nonprofit organization based in Canada, he said. The hospital is one of the most advanced of its kind in the southern region of Afghanistan. One of the most impressive elements of the project is the water processing plant, he added. It uses a multi-stage process to clean and sterilize water to the standard necessary for hospital conditions and also is being used as a model for future water plants throughout the country. Contractors also recently broke ground on phase two, a $2.6 million hospital expansion that will house an additional 50 patients, Skidmore said. With the hospital ribbon-cutting held Dec. 15, the mentoring team now is looking forward to starting the job it came to do. The team is made up of a total of 18 airmen: three doctors, three nurses, three administrators, a radiologist, a pharmacist, a medic, two lab technicians, a pharmacy technician, a radiology technician, a biomedical equipment technician and a logistician. Team members will work with their Afghan counterparts to create a baseline of skills, Seay said. There also will be a lot of focus on sterilization and sustainment of equipment and resources, he added. Together, the team hopes its efforts can help the Afghan National Army to rebuild the country and be effective at maintaining peace and security. Photo - Air Force Tech. Sgt. 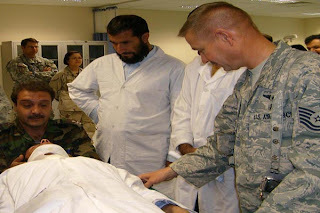 Edward Weaver, a medic deployed from Travis Air Force Base, Calif., instructs Afghan National Army medical personnel on spinal immobilization techniques at the newly opened Kandahar ANA regional hospital in Afghanistan. The medical mentoring team arrived to find the construction 500 days behind schedule and immediately took on the task of supplying the hospital and getting it opened before continuing the mission of mentoring Afghan National Army medical personnel. Photo by Col. (Dr.) Thomas Seay, USAF. BAGHDAD, Iraq – Coalition forces held a release ceremony for 100 detainees Wednesday at Camp Cropper in a gesture of goodwill and reconciliation during the holiday of Eid al Adha. The ceremony honored the joint effort by the Government of Iraq and Coalition forces to increase the average number of detainee releases per month. 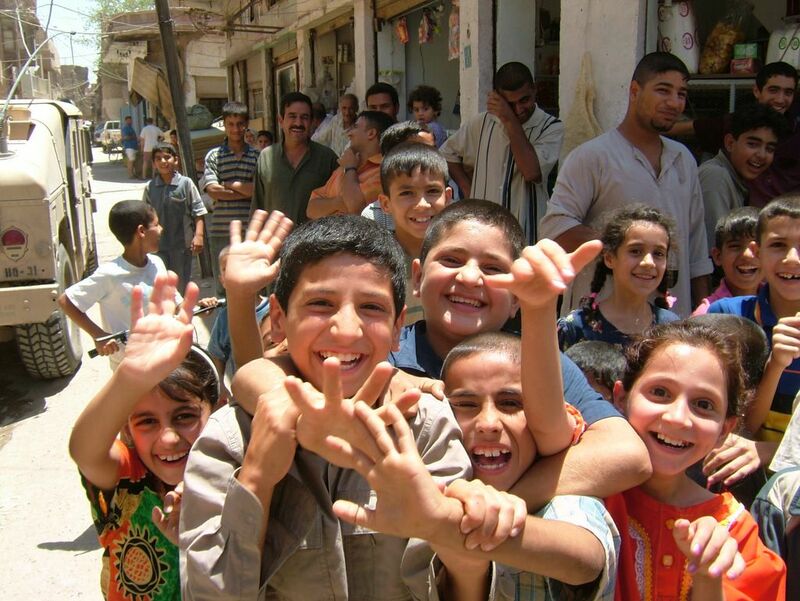 Individuals are only released after they are deemed to no longer be an imperative threat to the security of Iraq. The majority of the detainees were released through a review board process, when they had the opportunity to address their cases personally. They also made a pledge to an Iraqi judge, swearing to maintain peace and good conduct. While in detention, the detainees had the opportunity to volunteer for a number of programs, including basic education courses, religious discussions, vocational training and work programs designed to help them reintegrate and function as productive members of the community. All 100 detainees were released Wednesday. Approximately 850 detainees have been released so far during the Hajj and Eid al Adha holiday season. 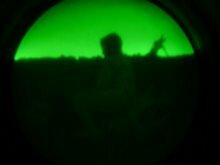 BAGHDAD, Iraq – Coalition forces captured a Special Groups leader and detained two other suspected criminals during operations to disrupt criminal element networks early Sunday in the Baghdad area. The targeted individual reportedly supplied various weapons, such as explosively formed penetrators, rocket propelled grenades, improvised explosive devices and mortars, to various Special Group criminal elements to aid in attacks on Coalition forces. He was coordinating criminal cells throughout the Diyala province. In addition, he was reportedly an associate of several other senior-level criminal element leaders who were involved in attacks on Coalition forces. 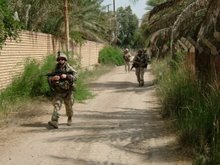 Intelligence led ground forces to the target area, where they captured the targeted individual and detained the two other suspects without incident. During the operation, ground forces also discovered two assault rifles, two pistols, two machine guns, night vision goggles and large amounts of American and Iranian currency. NBC reversed course Saturday and decided to air a conservative group's television ad thanking U.S. troops. The ad, by the group Freedom's Watch, asks viewers to remember the troops during the holiday season. NBC had refused to air the ad because it guides viewers to the Freedom's Watch Web site, which NBC said was too political. "We have reviewed and changed our ad standards guidelines and made the decision that our policy will apply to content only and not to a referenced Web site. Based on these amended standards the Freedom's Watch ad will begin to run as early as Sunday." NBC' head of standards and practices, Alan Wurtzel, notified Freedom's Watch's media consultant Saturday by e-mail, writing: "This will confirm that the Freedom's Watch spot is approved for air." NBC initially said that airing the spot would violate the network's prohibition on controversial issue ads. Wurtzel, in an interview Friday with The Associated Press, said NBC found nothing wrong with the ad's content, but rather objected to the link to http://www.FreedomsWatch.org, viewing the Web site as too political. The group's home page is critical of liberals and has a link to a page urging lawmakers not to "cut and run" from the war in Iraq. The home page also links to another Freedom's Watch page dedicated to ways to assist the troops and provides links to organizations that send care packages to soldiers. News of NBC's initial rejection caused an angry reaction on the Internet. Former House Speaker Newt Gingrich, appearing on the Fox News Channel on Friday, called for a boycott of NBC. Freedom's Watch, a group backed by wealthy Republican fundraisers, has emerged as one of the best-financed conservative groups. It seeks to be a vocal advocate of President Bush's current policy in Iraq. NBC has nixed holiday advertisements meant to thank troops for serving overseas in opposition to the inclusion of a non-profit's Web address. Click here and here to view the ads that NBC won't air. "Per my previous email, the www.freedomswatch.org website will have to be redacted from the commercials for approval. This comes from Alan Wurtzel and Rick Cotton," according to one of the notes. Wurtzel is president of research at NBC. Rick Cotton is general counsel for NBC Universal. Speaking with FOX on Friday, Wurtzel said NBC has no problem with the content of the ad, specificallythe well-wishes to troops. However, he said, the link to the website violates their policy on controversial issue advertising because it encourages political action and other activities. He said the policy is applied consistently across the board and this group was not targeted in any way. Wurtzel also expressed general concerns that NBC has about people with "deep pockets" being able to buy up a great deal of advertising and affect public perception on any issue, solely because they have the money to do it. Freedom's Watch President and CEO Bradley Blakeman told FOX on Friday that this is not the first time NBC has turned down his group's ads and believes it has a specific objection to his group's support for the War on Terror. "NBC asked us to re-vamp our Web site. They wanted to censor us, and we said, 'No we're not going to be censored,'" Blakeman said, noting that the organization's Web site points to more than 20 other non-profit Web sites where readers can thank and support troops. NBC also objected to using images including military uniforms and vehicles and asked for proof of government approval for the group's use of the images in its ads. Freedom's Watch says it has never been questioned on that before and paid for the rights to use the images from an independent licensing company. E-mails provided to FOX show that NBC also might have objected to the ads on its in-house issue advertising policy. 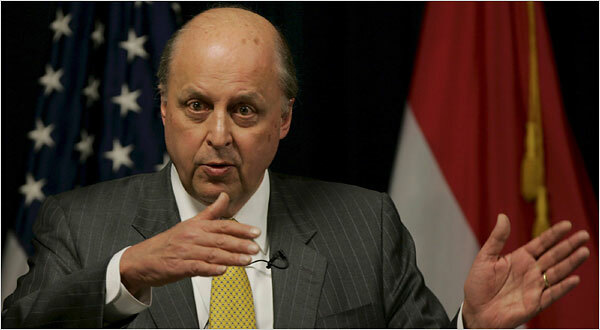 BAGHDAD, Dec. 2 — Deputy Secretary of State John D. Negroponte, in Baghdad after a week of meetings with Iraqi provincial leaders, said Sunday that lawmakers must take advantage of the decline in daily violence in recent months to pass crucial legislation and improve basic government services. 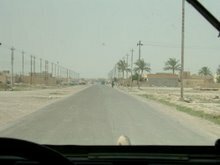 Mr. Negroponte, a former ambassador to Iraq, said if Iraq’s sharply divided Parliament did not reach a consensus “in the near future” on matters that would improve the lives of Iraqis, it risked losing the gains in security that had come in part because of the increased number of American combat troops. In particular, he said, Washington was counting on Iraqi lawmakers to pass two languishing bills that would help stabilize the central government: an oil revenue-sharing law, and a measure that would allow more former members of Saddam Hussein’s Baath Party to take government jobs. “It would be extremely helpful if this could be passed and go forward as an indication that the people and government and the legislature of Iraq are prepared to build on the security gains that have been achieved,” he said. Mr. Negroponte also said a referendum vote in Kirkuk on whether to join the Kurdish-controlled region would probably not occur this year. “Clearly it’s not going to be possible between now and the end of this year to mount a referendum,” he said. Also on Sunday, the leader of Iraq’s largest Sunni Arab political bloc said he and his fellow lawmakers would return to Parliament after his release from a three-day house confinement. The lawmaker, Adnan al-Dulaimi, the leader of the Iraqi Consensus Front, told an Iraqi television station on Sunday that he was allowed to travel from his house to a hotel in the Green Zone. After Mr. Dulaimi left his house, Iraqi Army troops arrived and removed the blast walls surrounding it, said his son, Muthanna Adnan al-Dulaimi. The removal of the walls appeared to suggest that Mr. Dulaimi would no longer have the benefit of government protection unless he was in the Green Zone. Consensus Front members walked out of Parliament on Saturday to protest what they said was the government’s restriction on Mr. Dulaimi, part of a law-enforcement operation on Thursday in which dozens of his security guards were arrested after a car bomb was discovered in an alley near his Baghdad office compound. The episode was another in a series illustrating the profound problems within the Iraqi government in stopping infiltration by insurgents. While Mr. Dulaimi’s colleagues privately expressed doubt that the politician, an elderly man, was directly involved in the criminal activities that his guards were accused of engaging in, he also seemed unable to stop them. Also Sunday, a roadside bomb in the Mansour district of west Baghdad killed two policemen and wounded four others, an Interior Ministry official said. Gunmen in the same neighborhood also killed a police official as he was heading to work, the Interior Ministry official said, speaking on condition of anonymity. 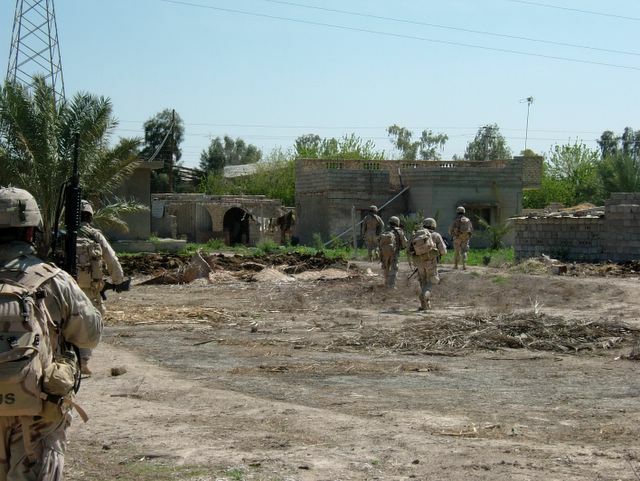 Iraqi security forces were subject to other attacks around Iraq on Sunday. In Baquba, northeast of Baghdad, a suicide bomber blew himself up near a police patrol, wounding 14 people, a city police official said. In Hawija, west of Kirkuk, gunmen killed five Iraqi solders as they drove out of an army base, a police captain said. In Falluja, Iraqi security forces found a mass grave containing about 20 bodies of men, women and children, the police said, Reuters reported. In Mosul, Iraqi policemen discovered six bodies, including those of two policemen, in different areas of the city, the Interior Ministry official said. 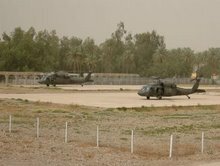 Alissa J. Rubin contributed reporting from Baghdad, and Iraqi employees of The New York Times from Mosul, Diyala and Kirkuk.